Filipino software developers and engineers will gather at the very first symposium about the latest software technologies around the world. <>The Philippine Software Industry Association (PSIA) and the Department of Science and Technology-Information and Communications Technology (DOST-ICT) Office will launch the first software engineering conference of its kind in the country. The Philippine Software Engineering Conference aims to expose local software engineers to the latest engineering strategies and cutting-edge tactics. 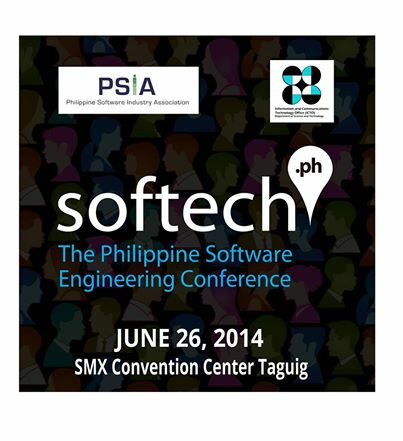 “The time is right for SOFTECH 2014 in the Philippines, a high-level software engineering and technology conference like no other. As a leading provider of software development services to the global market, this will certainly add to the wealth of Filipino software engineering talent,” says Joey Gurango, SOFTECH.PH chairman and president of PSIA. With the theme “Building the Internet of Things,” the conference will discuss three different learning tracks---Agile, Tools, and Architecture---and will also feature exhibits by local and global software solution providers that celebrate the future of Filipino software engineers. The whole-day conference will be held at the SMX Convention Center in SM Aura, Taguig City on June 26, 2014 (Thursday) from 8:00 a.m. to 5:30 p.m. PSIA members and software solution providers are encouraged to attend the conference, which will feature live demos, panel discussions, and group activities led by accomplished software engineers and industry experts. Prominent speakers from the software industry include Orange & Bronze Software Labs Co-Founder Calen Legaspi, VisTracks Inc. President & CEO Stephen Eick, and Pivotal Chief Technology Officer for Asia Pacific Japan Steve Illingworth. Up-and-coming software engineers and developers should grab the opportunity to thoroughly learn more on the array of topics that the speakers will lay on the table. Agile Myths and Conceptions, Analytics-Enabled Software Design, QA/QM Testing Tools, and Kanban are just some of the few areas of discussion that will be conferred during the event. “SOFTECH 2014 will be a real geek-fest. No sales talk, no marketing jargon. Software engineering session, by software engineers, for software engineers,” Gurango closes. SOFTECH.PH, which is scheduled during the DOST-ICT Office led National ICT Month, is a sister conference of SOFTCON.PH: The Philippine Software Business Conference, which is also organized by PSIA in partnership with the DOST-ICT Office.